Bhagwan Mahavir Nirvaan Divas popularly known as Diwali is round the corner and I am sure everybody must be busy celebrating this festival of lights. You are welcome to send your articles on this festival to us and we can publish few in our forthcoming Diwali Newsletter. JAINA Board of Directors and Executive Committee met at Siddhachalam and the first Board meeting was very participative. I congratulate Maheshbhai Wadher, JAINA First VP, for being appointed by Executive Committee as Convener, JAINA Convention 2019. I do not desire anything other than my own self. Let me remain stationed in my inner being, discarding all else. JITO London 3 Day Event in London with over 225 Attendees from 23 countries. First day day sessions were how to launch JITO International Chapters in different countries across the globe. Second and Third day sessions was to create opportunities for startup and early stage Entrepreneurs to connect and pitch their business ideas to potential investors, venture capitalists and high net-worth individuals and mentors to launch their products and scale their businesses. JITO USA will be doing PreLaunch Events in New York - Nov 15, 2017 followed by San Francisco, Chicago, Detroit etc. with official Launch next year in Washington DC. JITO-USA (Jain International Trade Organization - USA) vision and goal is to unite all Jain professionals and business leaders across the USA. This is the next step in our journey as 1st or 2nd generation American Jains to leave a strong foundation and legacy for our future generations to build and succeed upon. The Jain International Trade Organisation (JITO) is an global organization which brings together a network of Jain professionals, business leaders, industrialists, college students to achieve higher economic prosperity, enrich humanity, and create economic empowerment for the community at large. JITO maintains a platform for professionals, business leaders and college students for networking, mentorship, consulting, employment opportunities, career growth, professional development, conducting workshops and training programs. It promotes public awareness of its values and achievements of its members and provides scholarships and humanitarian aid. JITO maintains a website for professional networking and for members to exchange information. For more information on JITO India please visit www.jito.org. For more information on JITO London event please visit www.jitopreneurs.com. Rajul was the daughter of Ugrasain, who was the king of Junagarh. When Rajul became young, it was decided that she should be married to Prince Nemi Kumar, who was the son of King Shamudra Vijay of Shauripur. 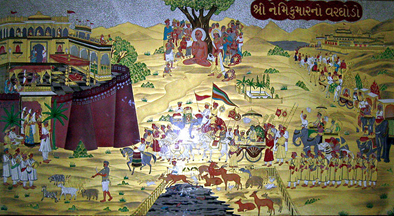 On the fixed day the bridegroom Nemi Kumar reached Junagarh with his baraat. At that time Rajul was very happy and she was peeping from the palace. When the baraat was entering in the city, Nemi Kumar saw the animals in a bara. They were crying very badly. Nemi Kumar asked to his charioteer about this sorrowful scene. The charioteer replied that these animals would be killed for the food of baraat. Hearing this, Nemi Kumar became sad and said to his charioteer, "Oh charioteer! Go back I will not marry now. I will go to Girnar for self-welfare. He became Digamber saint on the Girnar Mountain. 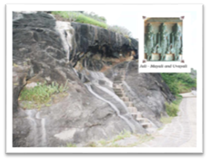 Rajul also followed him and she became a lady saint. After penance Nemi Kumar got only knowledge and went to salvation. Congratulations. You have reached the main gate. The gate is called Ram Pol. Beyond the gate is a corridor where all the porters rest. 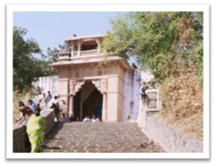 On the left before entering the gate is a warning sign by the management that says, “Eating or drinking anything is a severe sin on this holiest hill “Giriraj.” Except for water, eating, drinking anything, spitting, and urinating is forbidden. Despite this sign, cold yogurt is sold in clay pots on the left just before the gate. One thing that distinguishes a human being from rest of the beings is voice. A man can speak; can give vent to his thoughts distinctly. But other beings in the world are not gifted ones this way. Tongue though the animals possess but they are unable express through it. The tongue has two-fold work to perform, one is to help in eating, and the second is to help in speaking. An animal can do only the former work and not the latter work, whereas the human being does both of them. In life, for the progress of humanity there is an important job carried out by tongue is vitamin M, i.e. Influence. It means sweetness in tongue. Whatever you speak should be sweet and not harsh. This is very essential. This must be done invariably in life. There are persons who speak so lovely that everyone admires. They utter words as if flowers are being rained. And, on the contrary, there are persons who speak harsh words and they appear as if nails are being scattered. Jain Society of Metropolitan Washington (JSMW) had a very pleasant, joyous, and successful religious bus trip to visit Jain Society of Pittsburgh, Jain Society of Greater Cleveland, Jain Society of Metropolitan Chicago, Jain Society of Greater Detroit, and Hindu Jain Temple of Toledo during the July 28-30, 2017 period. During this long journey of around 1,500 miles, there were 44 adults (13 years and over), 5 children (between 3 and 12 years), and 1 infant (under 3 years of age) who participated in this yatra. 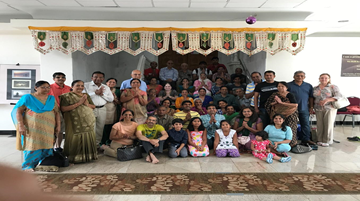 Despite a wide age gap from 20 months to 84 years old, each yatree had fun as well as had a chance to participate in various religious activities, including Seva Pooja at various temples, just to name a few. While on the road, the yatrees spent time playing Jain Bingo (108 Parshvanath), Jain puzzles, Antakshari (including Jain stavans), and Memory games. The yatrees had wonderful time visiting Chicago downtown (Willis Tower, Millennium Park, and Buckingham Fountain). As a bonus, the yatrees were fortunate to visit the BAPS Swaminarayan Temple in Bartlett, IL followed by a temple tour.